We love the sun here at Propertytoolbox - you can't beat that beam of sunlight into the house on a wintery afternoon or a summer morning. But what if your house doesn't get a speck of sun three months of the year due to surrounding hills? Or your sunniest room is the wash-house? If natural light, and sun are important to you, make sure you check it out. Sunlight is one of the hardest, if not impossible things to change about a house. Many a person has wished they could rotate their house or chop down a neighbour's tree, but it is just not feasible most of the time. No house will be perfect, but think about what is right for you. Think about what you consider to be the sunny side of the street in the areas you are looking, and also check the orientation of living accommodation to the sun in houses you visit. Watch out for hills, large buildings and trees! The sun is a lot lower in the sky in winter so surrounding features can really impact the amount of sun you may get; try to take these factors into account. How do you do this? Take your compass, then work out where the sun comes in, when, and for how long. If you don't have a compass or can't visit the property, street maps, council geo-search websites, and Google Maps are all displayed with North up; use this to orientate yourself & work out when and how sun will come into a house. Another good general rule is that for any time of the year, at approx 1pm, the sun is due north and, for that time of year, at its highest point in the sky. 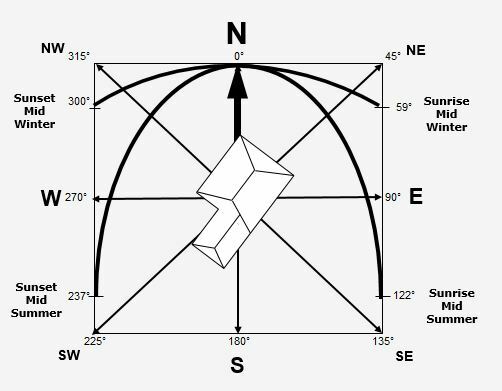 If all this has your mind whirring, think about the house you live in now, what's its compass orientation and where does the sun comes in at various times of the day in the summer and winter? If you can visualise this new house with the same orientation, you can get a good picture of sun.